Go on up to where the road forks, follow it round to the left towards West Mains farm. 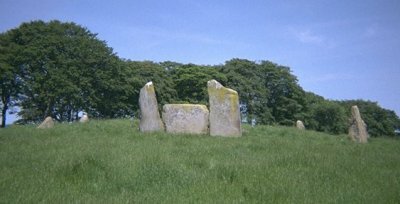 On the way, you'll see Balgorkar stone circle at the far end of the field on the right. Ask permission at the farm to go up to the circle as there are usually cows or crops in the field. This is a beautiful circle of pale stones with golden lichen against a backdrop of mature beeches. It is an early one being set out on a true circle. Six stones, some of red granite are still standing. In the ploughed-out central cairn charcoal, cremated bone, and urn sherds were excavated and quartzite was found scattered around the recumbent stone. To the south-east near the edge of the same field are two tall outlying stones standing like gate posts, which may have been part of another circle. There are many more, isolated standing stones in the vicinity, most marked on the map but you could go on forever... Nearby Castle Fraser (NTS) is well worth a visit, with woodland walks, gardens and tearoom for hot, tired or lost circle hunters.